About seven-in-ten U.S. parents younger than 50 (71%) say it’s unlikely they will have more children in the future – and among childless adults in the same age group, about four-in-ten (37%) say they don’t ever expect to become parents, according to a Pew Research Center survey conducted in July and August. Among parents under 50, four-in-ten say they’re not likely to have more kids in the future because they just don’t want to, while 30% point to some other reason for not expecting to have more kids, according to the survey. 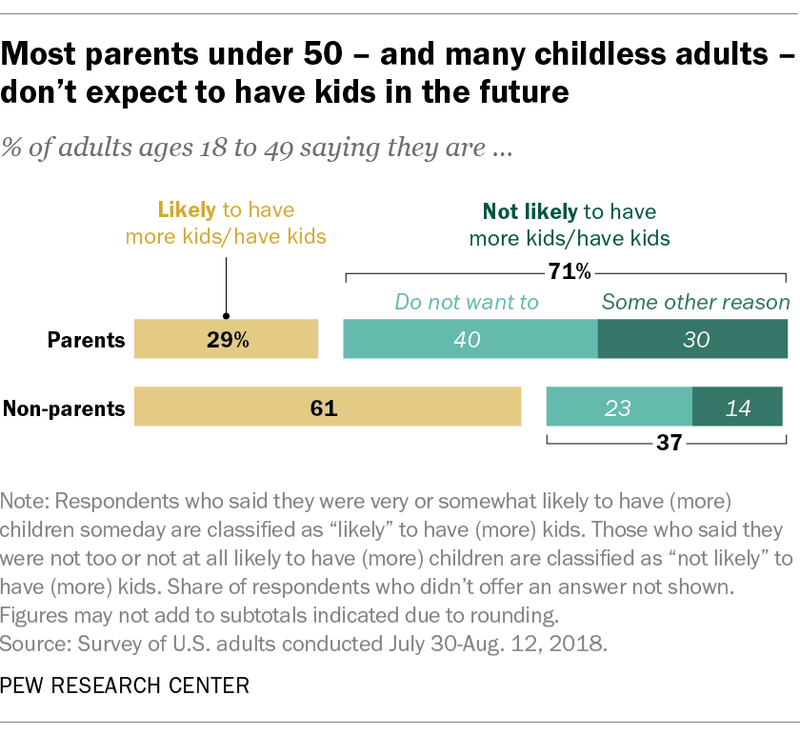 Among childless adults under 50, meanwhile, around a quarter (23%) say they’re unlikely to have children in the future because they just don’t want to, while 14% name some other reason for not expecting to have kids. Parents ages 40 to 49 stand out as being far more likely than those under 40 to say they don’t expect to have more children. About nine-in-ten parents ages 40 to 49 (91%) say they are unlikely to have more children in the future, compared with 56% of parents younger than 40. Three-in-ten childless adults in this younger age group say they are unlikely to become parents someday (there are too few childless adults ages 40 to 49 in the sample to analyze them separately). The survey asked those who say there is some other reason why they don’t expect to have more children or to have children at all to elaborate on those reasons. The responses of childless adults cannot be analyzed due to the small number of respondents in this category, but among parents who don’t expect to have more kids, the most common response is that either they or their partner is unable to have children due to a medical reason (41% of parents ages 18 to 49 say this). Age is the second-most cited reason, given by 25% of these respondents. A small share (6%) cites financial reasons, such as the cost of child care, and 3% say they either don’t have a partner or that their partner doesn’t want to have more children. Mothers and fathers ages 18 to 49 who don’t expect to have more children are about equally likely to say this is because they don’t want more kids: 58% of mothers and 55% of fathers say this. Among parents younger than 40 who say they are unlikely to expand their families, more say this is because they don’t want more kids (64%) than say there is some other reason (36%). 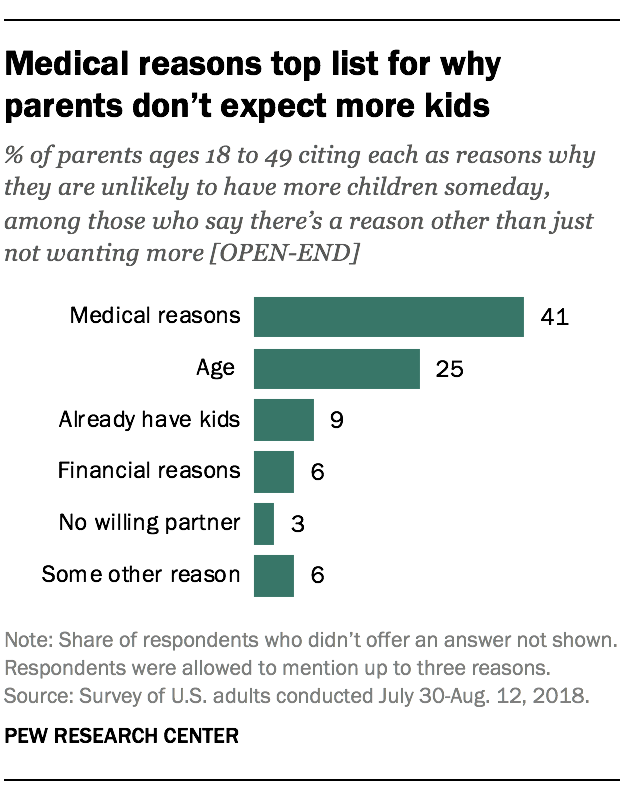 In contrast, 49% of parents ages 40 to 49 who don’t expect to have more children say there’s another reason for this other than simply not wanting more. These findings come as the U.S. annual fertility rate has hit an all-time low of 60.3 births per 1,000 women of childbearing age. Annual fertility declines have been dramatic over the past decade, as a result of the Great Recession. But even as the economy has rebounded, fertility has not followed. Declines in what people consider the ideal family size also may play a role. During the U.S. baby boom – a period that was characterized by unusually high fertility – most said the ideal family size was three or more children, but since then, the number has declined. Today, the largest share of Americans report that two or fewer children is the ideal family size. A number of broader demographic and cultural shifts also may be contributing to U.S. fertility declines. In the long run, rising educational levels and delays in marriage have led to the postponement of parenthood for many. At the same time, the shift toward women working outside the home has likely contributed to the decline as well, especially when coupled with rising child care costs. Note: See full topline results and methodology for the survey.